Felis Chaus is the scientific name for the Jungle cat. It is a wild cat species that looks like a large domestic cat. There is a resemblance to the Abyssinian purebred cat. The coat is plain tawny grey and ticked. Its color varies slightly. It is found from Turkey to Cambodia – a very wide distribution. Its name is misleading as this wildcat species prefers swamps and reed beds – next to water. It is also called the “reed cat” or “swamp cat”. Due to their wide range they are also found in dry grasslands. Felis chaus feeds mainly on small mammals such as mice and rats. They leap to catch birds. If you are involved in the cat fancy you will know that the wild cat hybrid, the Chausie, is a jungle cat/domestic (Abyssinian cat) cat mix. Apparently, the jungle cat itself is also a fairly popular domesticated cat in the USA. In fact more people search for breeders of the jungle cat than they do for information to learn about this cat. This trend for the taming and domestication of Felis chaus in the USA is not new. In ancient Egypt, Egyptians did it too and then mummified them. Felis chaus was not domesticated by the ancient Egyptians however. As mentioned, to the casual eye, the jungle cat looks a bit like the Abyssinian cat (but less refined) and of course the Chausie. The Abyssinian cat is said to originate in Egypt or somewhere in and around the Indian Ocean, probably, in fact, from the east coast of India. Felis chaus also occupies Egypt so their is a geographic connection and might be an ancestral connection – the Abyssinian originating from the jungle cat, why not? We don’t know. The size of felis chaus is similar to that of the domestic cat weighing from 3 to 10 kgs or about 7 to 22 lbs. It is a little larger and lankier, however. 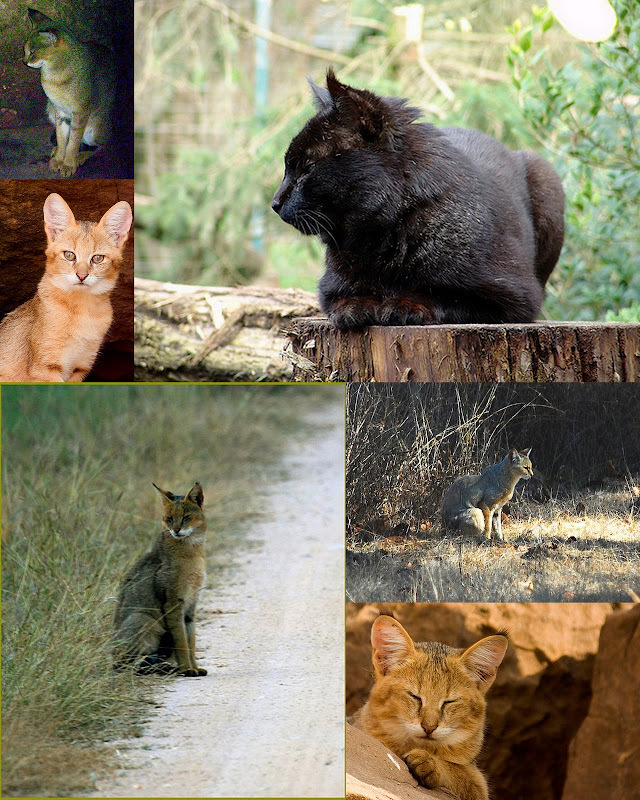 A size comparison chart with other felids can been seen here: Wild Cat Species by Size. The coat of felis chaus is plain. It is basically an unmarked tabby coat. Kittens have markings, either spots or stripes that fade at sexual maturity. If an adult retains markings it is on the tail, hindlimbs and forehead. The muzzle is white. The colour of the coat is from tawny grey to a reddish, sandy colour as shown in the lower right photograph in the collage above but the undersides are lighter or white. They have dark hair tuffs at the end of there ears. The tail looks relatively insubstantial compared to many other wildcats such as the Andean cat or the clouded leopard and is more like that of the bobcat. The face is relatively slim compared to the squarer faces of other wild cats. The ears are quite large (particularly the ears of the cat top left in the collage). The black jungle cat in the collage is not that rare. Apparently they occur frequently in south east Pakistan and they are also found in India. They are called “melanistic” (see a black Chausie cat). This is in reference to the pigment “melanin” that is in each individual hair. The similarity to the domestic cat is not just skin deep — it has been established scientifically. There might be subspecies of the jungle cat as the distribution (range) of this cat is very wide but no research has been carried out to establish this. For more detail please see:Jungle Cat Range. Felis chaus prefers riverine swamps, reed beds, tall grass, thick brush. It prefers not to be at high elevations and is found at elevations below 3,200 feet. It can adapt to desert and steppe (grassland without trees). Felis chaus is a stealthy ground hunter. It can make high leaps to try and catch birds like the caracal and leaps onto rodents like the serval. It main prey is small mammals such as rats, mice, gerbils, squirrels, frogs. Birds are also an important prey item. Insects are also a source of food. Occassionally snakes are taken. Young are normally born between December and June. Gestation is from 63-66 days. Dens are burrows, tree roots, hollow trees and hedges etc.. Litter size: 3-6 kittens. They eat solid food at 49 days and weaned at 102 days. At 6 months the are hunting. The population is decreasing but it is classified as Least Concern LC. In 2002 the Sunquists, in Wild Cats Of The World, described felis chaus as the commonest of the small wildcats. However, it population size may be overstimated. The rather generous classification of LC does not, it seems , square up with the general tenor of the appraisal of the survival of this wild cat by the Sunquists, which is described as being adaptable and flexible enough in both habitat and prey to “probably” ensure its survival. I would have thought a “probable” when added to a lack of substantial research and large declines in numbers in Asia and Euriope would warrant Near Threatened. But the criteria is all their own. It adaptability translates to living in and around agricultural land (hence being more visible and its population being overestimated – perhaps). It would also seem to be in part the reason why it has been so heavily persecuted and exploited; trapped and killed, I mean for its pelt. Apparently, before export of skins was banned in 1979, there were over 300,000 in India (skins that is!). So the usual threats are in place: killing it for sale of body parts, habitat loss and/ fragmentation and in the destruction of habitat comes the destruction of this cat’s prey forcing it to seek alternatives such as poultry, which then puts the cat in conflict with farmers. It seems that large numbers where killed (perhaps still are) because of this state of affairs as it is considered a pest by some famers. This cat prefers swamp land despite its sightly misleading name and wetlands are gradually being eroded by human activity. Farmers could do more it seems to protect their livestock rather than simply killing the cat. Despite this general level of exploitation it is “considered” common in some parts of its geographic distribution, namely in India, Pakistan and India. In Asia it is less common due to being trapped and in Thailand and Laos where is was once common it is now rare. This entry was posted in Jungle cat, Wild Cat Species and tagged Felis Chaus, jungle cat, wild cat species by Michael Broad. Bookmark the permalink.